Searched but couldn't find anything. I have a AdminCP Theme installed but when I install it the Login for the AdminCP has no theme as per say. No idea what I am doing wrong. How did you installed it and does problem appears for default theme too? (12-15-2017, 10:55 AM)Ikerepc Wrote: [ -> ] How did you installed it and does problem appears for default theme too? Anyway re-downloaded the default one and installed it then re-set it to a custom AdminCP Theme and the login part is the default AdminCP style? which ACP theme you are using ? does it appear normal within the admin control panel ? (12-15-2017, 11:19 AM).m. Wrote: [ -> ] which ACP theme you are using ? does it appear normal within the admin control panel ? 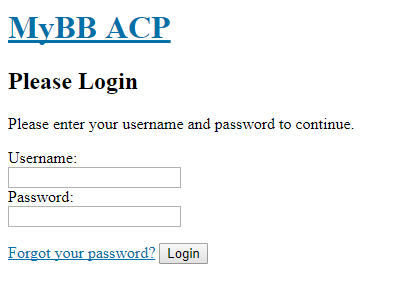 Yes, the theme is fine within the ACP itself, it's just the login and logout part that is default MyBB style. Now that I notice, It has been quite a while since it was last updated, could this be the problem? (may be a couple of times) or try checking with a different browser ..
Well it is recomended to keep your software up-to-date. But I don't think that is problem... Anyway, you can try to update your software and theme. I tried the hard refresh a heap of times to no avail so I switched to a different browser and even there the Login screen is the default style. (12-15-2017, 11:46 AM)Ikerepc Wrote: [ -> ] Well it is recomended to keep your software up-to-date. checked the style codes used for the theme & looks like it is intended behavior.